To be transparent is sometimes the best remedy to help facilitate healing and recovery. Transparency produces vulnerability, and to truly heal, we must become vulnerable. This is the story of how I got my stitches. In our Church Planting class at IBC, Bro. Sistrunk (a great church planter for the UPCI in Michigan) described what his view of a ideal church would be. Stubborn, faithful, not willing to compromise, and self starting. I marveled at his description because it explains my church to a tee. I have set under 5 pastors in my life and have not changed churches once. (I sat under Bishop Paul D. Mooney while I was at college. I have great respect for the things he has invested in my life.) I recall many lessons, many successes and many failures, and I have reaped vast amounts of knowledge about the heart of pastoring. It was 2004 and our church had been in the struggle of its life. Bro and Sis Moore took a great risk in pastoring our church. We have been persecuted by our own bretheren with great passion for many years, and they began to feel that heat the moment they stepped through our doors. The first few services revealed the immense amount of brokenness and pain that was present, and they began to dig, in such a way as to “bind the broken”. They began, through God, to piece us back together. We have always likened our church to the children of Israel. We had known that being in Pine Bluff was a sense of Egypt, but never had the strength to leave. God had been calling our church to White Hall since 1999, yet the appropriate doors were not opening. Bro. Moore caught that vision and began to work. After failed attempts to sell our very large church facility. (It set 500 and we had a family life center also on the property) We finally landed a deal; worth much more money than we had hoped for, and right before the economic collapse. God truly had his hand on us. We moved to a little UPCI church in Faith, Arkansas, yes the name of the city is Faith and we were there both in spirit and in the physical. Bro. McKosky had been the pastor there for many years. He and Bro. O.C. Marler used to run around together preaching and teaching, so being from IBC, I was naturally excited! There were many times in my first few years of college that Bro. Marler and I spent talking about the churches that he helped build in our area, and he has been back to preach for us many times in the past few years, and I have great respect for him. My Papaw has been a pillar in our church for many years, and it was he who first found the property that we now reside at. After speaking and praying with Bro. Moore about it, we purchased the property for a reasonable price and began the transition. We were now in the “wilderness and waiting” part of our journey. Now in the wilderness journey we lost the vast majority of the people that we had in the old church in Pine Bluff. Those who departed found a strong local pastor to guide them named Rev. A.D. Hill. In fact, the old Apostolic church, pastored by Marvin Rutledge, is now pastored and doing great things at WHUPC and Calvary's lighthouse. We have retained less than a fraction of what could have been said to be original. It could be stated, quite accurately, that we are now more of Bro. McKosky's church from Faith than that from Pine Bluff. Upon moving to White Hall we began to grow. When Rev. Kyle Champion, our present youth pastor, first arrived in Faith, our church was sitting at around 28 people and that with 4 youths. Now, at present, just 4 years later, we are consistently running over 100. God has blessed! Our church, spiritually, was approaching the river Jordan and we didn't even know it. In July 2010 we began to pray. Feeling overwhelmed with the positions that many of us had found ourselves in, we knew that without God, we would fail. In the past year, prayer has taken off. We have began to study the key factors that started Azusa and what was the foundation of A.D. Urshan, and that foundation was prayer. We began to institute prayer meetings that lasted for 4-6 hours and both youths and young adults flocked to them. There was truly something going on that we couldn't see, but we knew that God had us in our hands! The past few months had been very difficult in prayer. It had been a struggle to break through, but yet we were gaining endurance and that “go get 'em” attitude that is absent from the generation that I belong to. But then, as God always does, in a miraculous move of the Holy Ghost, the shell was broken and He began to take us to elevate our lives. The places we have been in prayer have been remarkable, in fact, words would fail me in explaining to you where we are, you must “taste and see”. We have been working on finding out what caused the Azusa revival, and replicating it, and can I tell you, prayer works. As we began to cross Jordan just a few weeks ago, nobody noticed, but Moses was remaining on the other side, safely seeing us across. Looking back now, things seem so clear. It's amazing how God will keep His hand upon those who will seek after Him. After decades of turmoil, God had sent a man to facilitate the healing process, and this was the final stitch. He came to us in a dire time, and has departed, leaving a church of great strength. He has restored unto the people hope, and the value of that hope is priceless. Though everything is not how I would have hoped it would be, all things are in Gods hands. And this one thing I know, 7 years ago we were 27 tired and worn saints, now we are 100 strong burning saints, poised for something EPIC. We have more IBC students at our church now than anywhere I know of, and believe me, it's for a purpose. If you're wanting to see an interesting church, keep us on your radar for the next few years, you'll be amazed at what God is about to do. Thank you Bro and Sis Moore for the labor that you have performed in God. Thanks Caleb and Josh for being awesome pillars in the Axiom Student Ministries, and great friends. Saturday nights, about 10pm you'll be in our prayers. 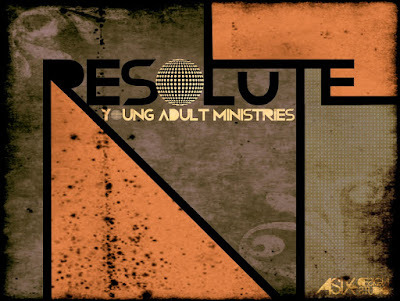 On behalf of Resolute Young Adults and AXIOM youth ministries, thank you and God Bless. Whenever you are going through a rough patch of life, if you turn to prayer, God will see you through. May this story encourage those who are going through it, keep your head up and your knees to the ground. God has it under control.